Franciscan Sister Phyllis Sellner, a member of the Sisters of St. Francis of Rochester, Minn., is celebrating the 50th anniversary of her profession of vows. of the Society of St. Vincent de Paul at its food pantry, the Pratt-Quigley Center, in Indianapolis. Previously, she ministered as a chaplain and counselor at Fairbanks Hospital, St. Vincent Hospital and the St. Vincent Stress Center, all in Indianapolis. 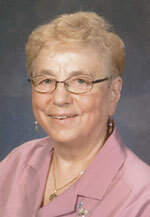 Sister Phyllis entered her community from St. Mary, Help of Christians Parish in Sleepy Eye, Minn., in the New Ulm Diocese. She earned a bachelor’s degree in education at the College of St. Teresa in Winona, Minn., and master’s degree in mental health, addiction and substance abuse counseling at Butler University in Indianapolis.